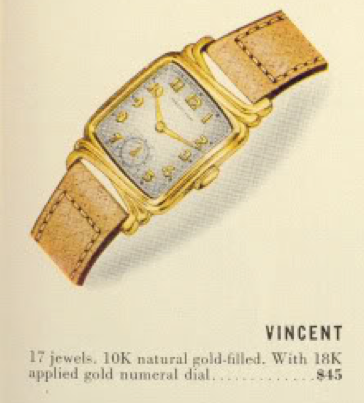 The Hamilton Vincent was introduced in 1940 along with a number of other new models. It was produced for two years and probably interrupted by WWII and not reissued. The Vincent comes in a 10K gold filled case with an interesting woven lug design. 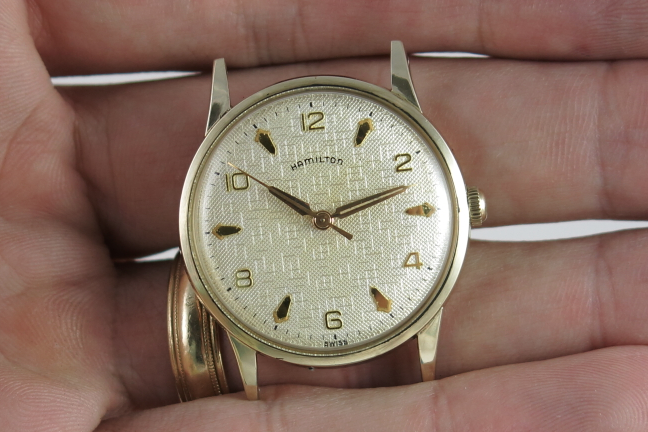 The dial is sterling silver with solid 18K gold numerals. No other dial options were offered. 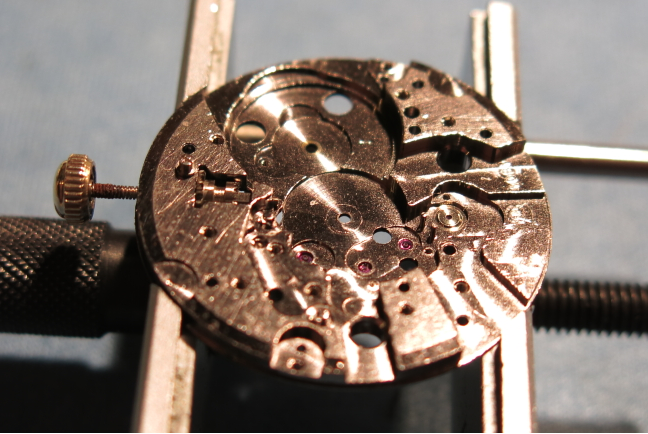 Under the dial is a 17 jewel 14/0 sized 980 movement. I purchased a Vincent in a lot of project watches last month and although the crystal was totally trashed with scratches, the case, dial and movement were in great shape. So after an overhaul and a new glass crystal, this Vincent looks great again! 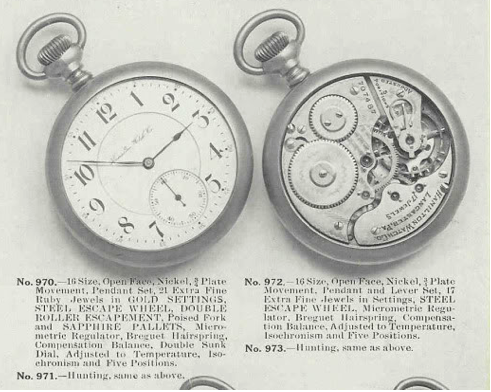 Hamilton began making watches in 1892 and strictly made pocket watches. 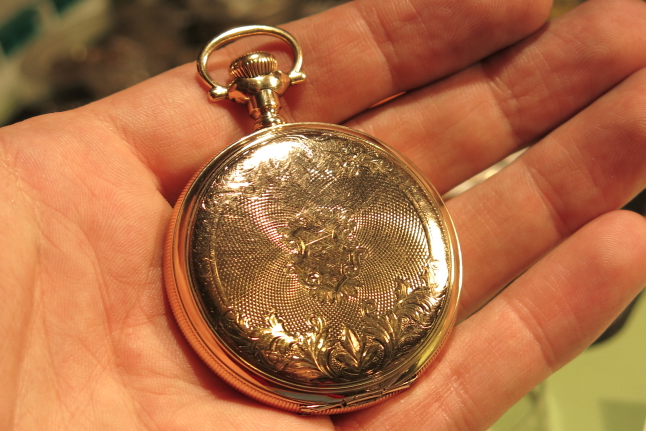 Pocket watches come in different sizes as well as with different case designs. 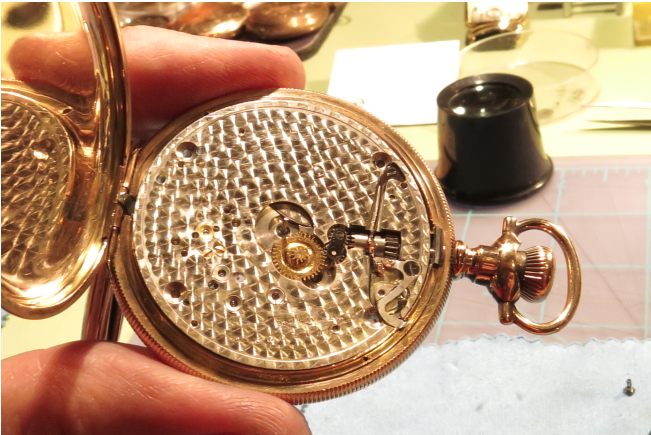 Two case styles are typically used... "open faced" where the dial is displayed through a glass crystal and "hunter style" - where the there is a flip cover over the crystal that is usually actuated by pressing in the crown. 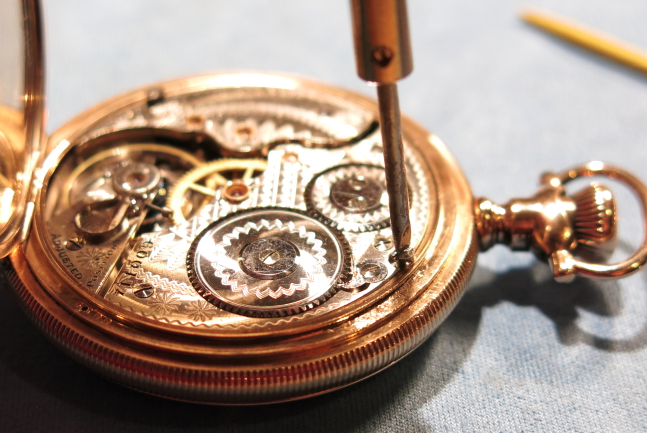 Hamilton's first pocket watch was an open face, size 18 grade 936 pocket watch. 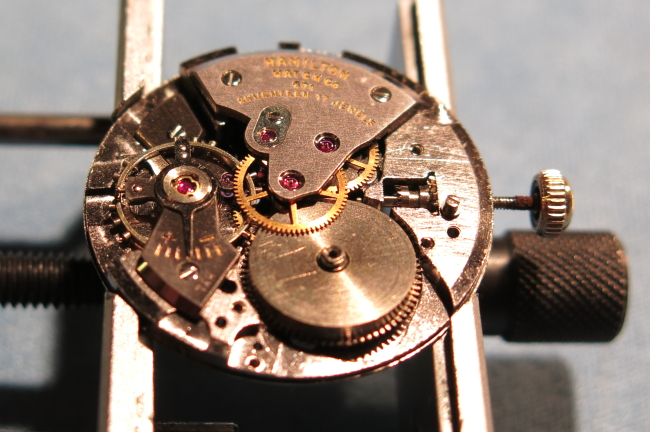 One little bit of trivia about Hamilton movements, is (at least early on) the even numbered grades went into open faced cases and odd numbered grades went into hunter-style cases. 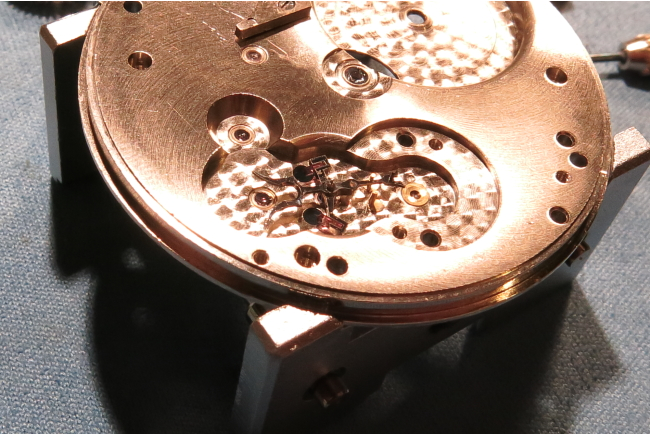 So an 18 sized, 21 jewel 940 movement went into an open faced cased but the 18 sized 21 jewel 941 was made for a hunter case. Got it? 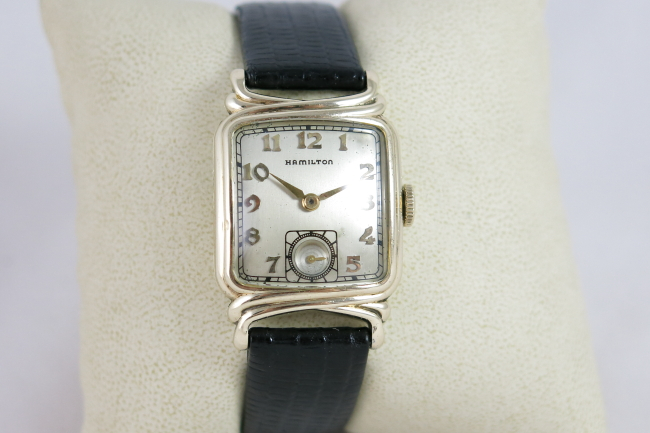 Sometimes you'll see watches have been moved from one style case to the wrong style case. I recently picked up a hunter-cased Hamilton. 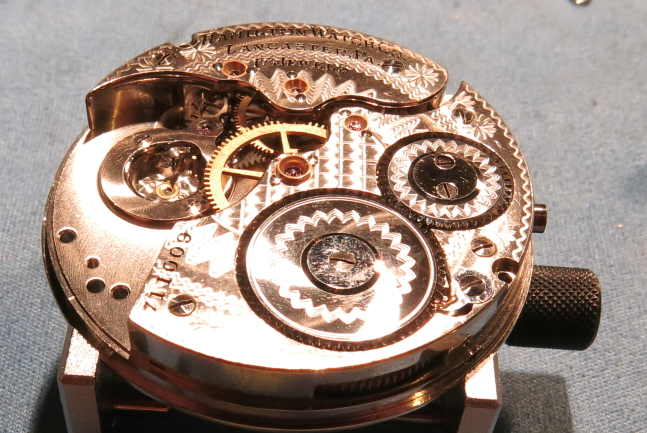 It has a 17 jewel, 16 sized 973 movement. 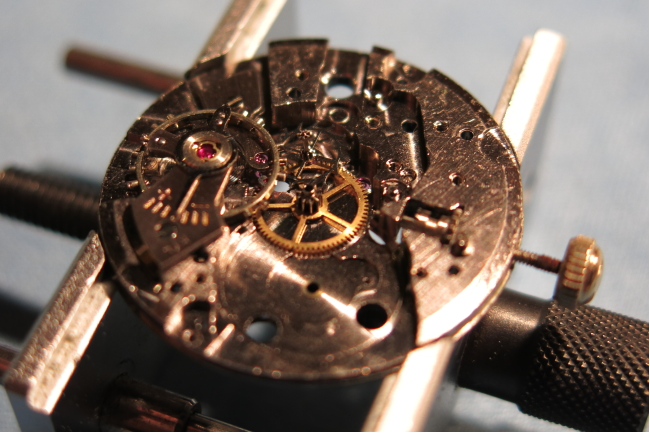 "Back in the day", as they say, you could go to a jeweler and pick out the movement and then pick out a case style that accommodated the movement and the jeweler would assemble the watch for you. 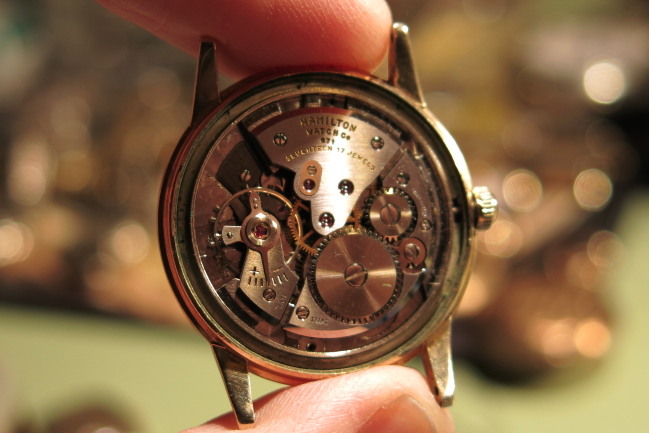 Sometimes you'll find a really nice movement in a very inexpensive case, or vice versa, depending upon the choices of the original buyer. I recently purchased a hunter style pocket watch and it's my only Hamilton version. I think they're somewhat less common than open faced versions. I make it a point to service every new watch I get before using them (you should too if you don't know it's history). So, I'll show you what it takes to overhaul a 973. First, here's a shot of the finished product. 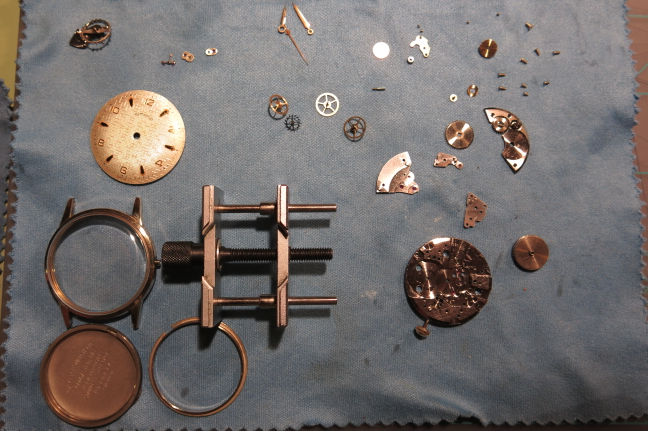 Of course, the watch must be disassembled. 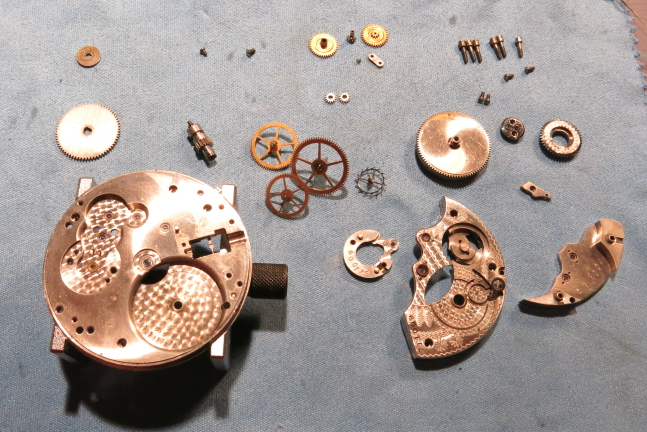 That follows the same course as pretty much every other overhaul I've posted but it's also the reverse of the re-assembly, which I will show you below. So here, all the parts are laid out and ready to go into the cleaner. I usually put my parts into baby food jars with cleaning solution (or rinse) and then submerge the jar in my ultrasonic cleaner filled with water. Unfortunately, a size 16 pillar plate (main plate) is too big to fit in a baby food jar, so cleaning all these parts takes a little extra effort. These parts are so large that cleaning the small parts separately from the really large (and heavy) parts is a good idea anyway. While the parts are being cleaned I will clean and polish the case. Hunter style cases have several parts... a front cover, a bezel to hold the crystal, the case center, a dust cover and the back cover. There are lots of surfaces to clean up. Everything is eventually cleaned and set out to dry before reassembly. 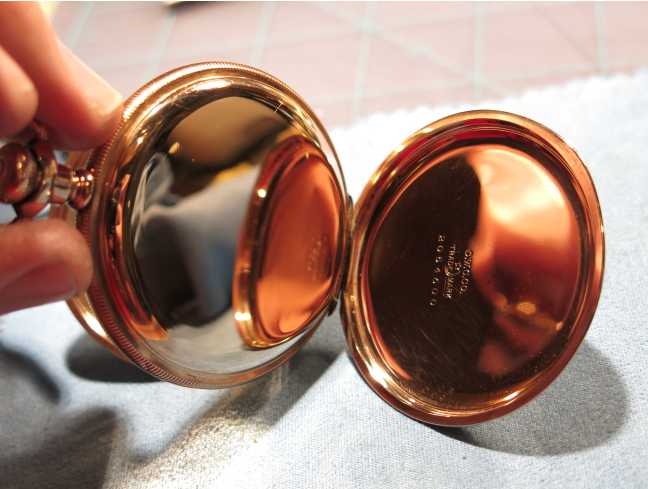 These parts definitely sparkle a lot more than before they were cleaned. 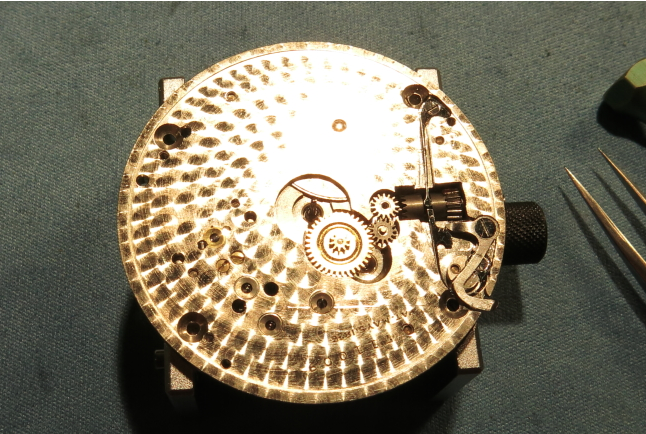 First to go back on is the winding pinion and clutch wheel assembly. This part engages the stem that it retained in the case. Springs and levers on the other side will allow the clutch wheel to slide from the winding position to the time setting position. The pallet fork in this movement is really interestingly shaped. Usually it looks like an anchor (and it's often called an anchor) but this one is definitely fork-shaped. It will go in next. All of the jewels get a tiny droplet of oil and then the parts can go in. In the shot below, the pallet fork is in place. It's bridge will go on next and secure it in place. Now the escape wheel and fourth wheel go in their respective positions. The escape wheel is just to the right. It's silver colored and hard to see. And the train bridge is secured to hold the two wheels in place. 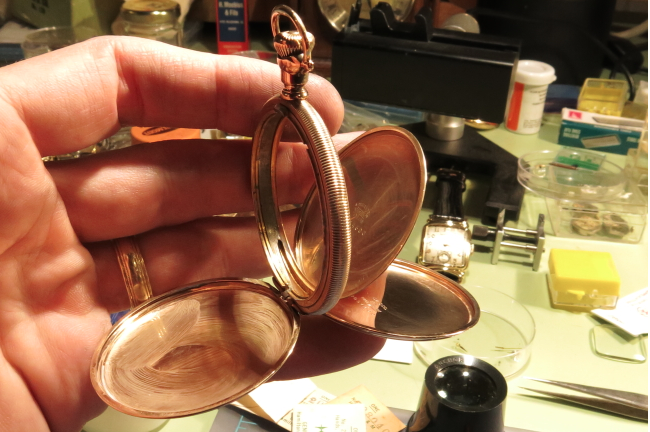 These pocket watches offer a LOT more room to see if things are lined up correctly before securing parts in place. Next, the third wheel, center wheel and mainspring barrel go into place. The center wheel is technically the "second wheel" in the gear train. The teeth going around the barrel make up the "first wheel". With everything lined up, the barrel bridge goes on and is secured in place. A gentle prod to the center wheel makes the pallet fork move, so everything is lined up and engaged correctly. The ratchet wheel (over the barrel) and the transmission wheel (aka winding wheel) go on next, with lubrication of all the bearing surfaces. 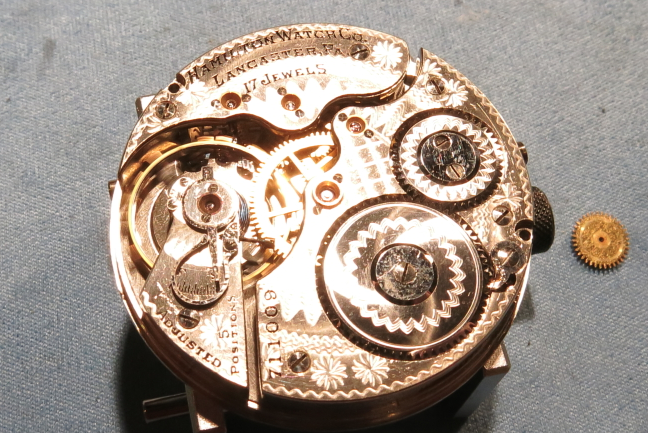 At this point I can turn my attention to the dial-side of the movement. The setting wheels, and minute wheel are installed. 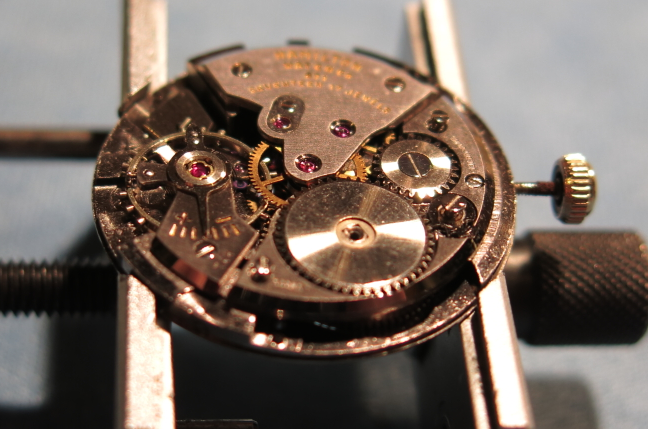 In this shot you can see the set lever on the right side of the movement. You have to pull that lever out in order to slide the clutch wheel over to the setting position. Push the lever back in and the clutch wheel slides back over to the winding position. In this shot it is in the winding position. There's another one later on with the works in the setting position. 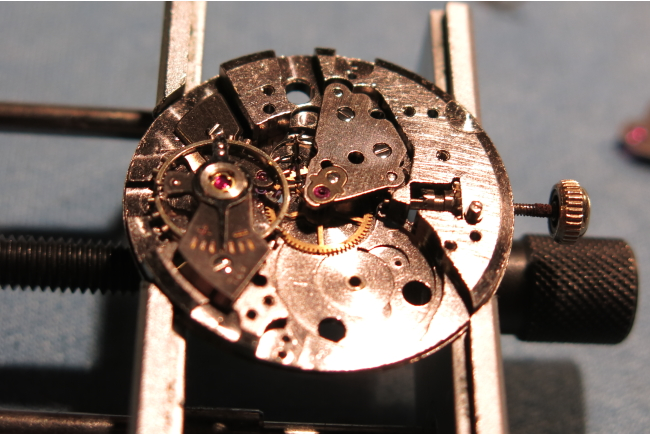 In order to put some tension into the mainspring, I temporarily put the movement back in the case so I can wind it with the crown. 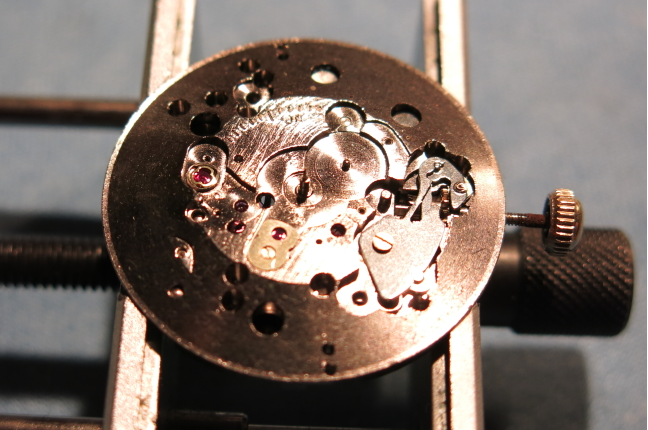 Next the jewels in the balance assembly get a droplet of oil and it is ready to go back in place. And here the movement is happily ticking away. 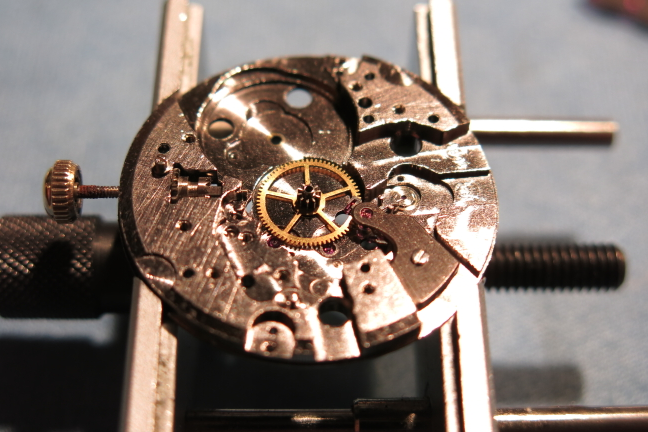 The cannon pinion and hour wheel go back into place and the movement is ready to have the dial put back on. Note the set lever is pulled out and the clutch wheel is moved to the left and engaging the setting wheels. 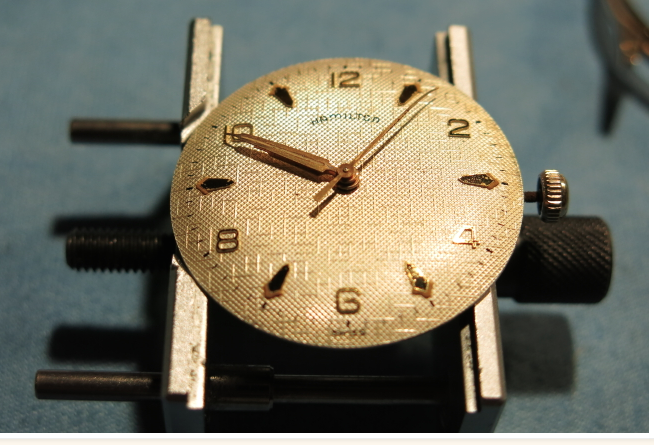 A trip to the timer shows it's running 4 seconds fast per day... not too bad for a 104 year old watch. 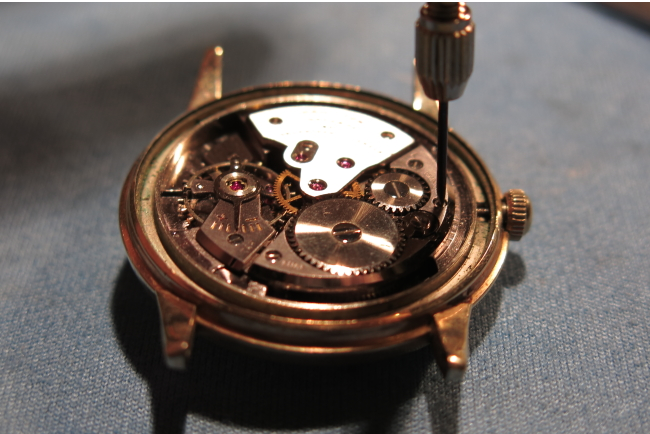 The movement is reinstalled in the case. 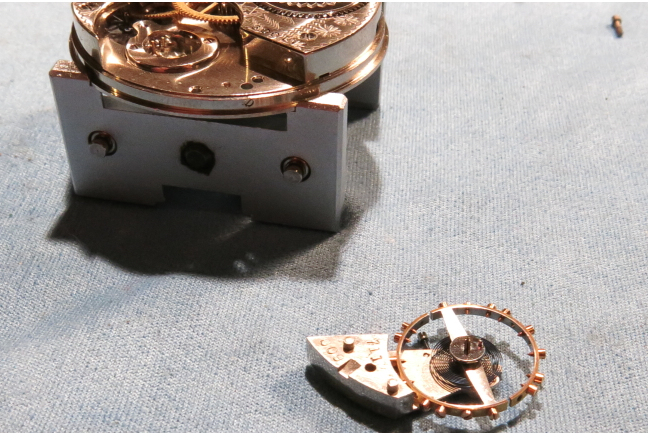 And it's secured in place with two case screws on opposing sides of the movement circumference. Everything is safe and secure so the dust cover and back cover can be closed up. This case is in excellent shape and free of engravings. Next the hands are reinstalled. All I need now is to purchase a low profile crystal to protect the dial and hands so this watch will be complete. 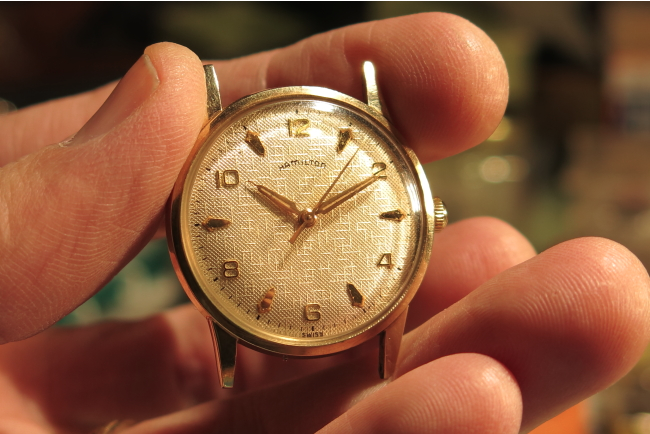 Part of the Men's Medallion Series, the 1962 Lindsay is the second model to bear that name (the other was made in 1953 for one year). 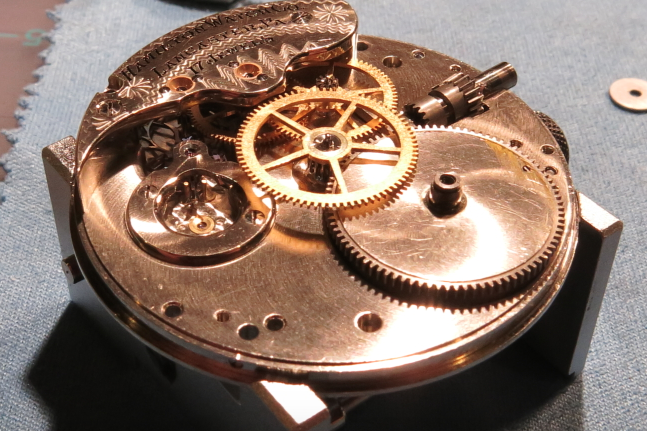 The 2nd Lindsay was produced for twice as long - and only made for two years. 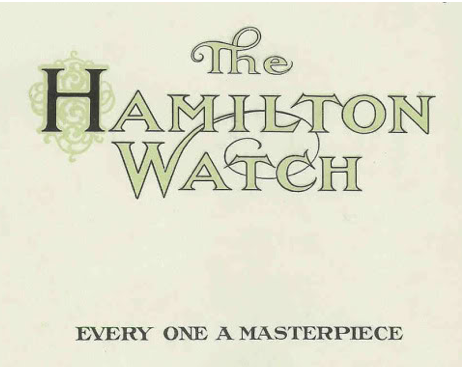 As part of the Medallion Series, the Lindsay is a higher end watch in the Hamilton line up. 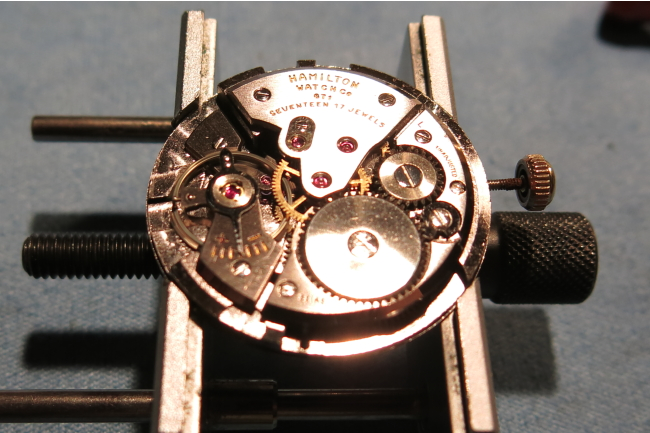 It featured Hamilton 12/0 sized, 22 jewel 770 movement. 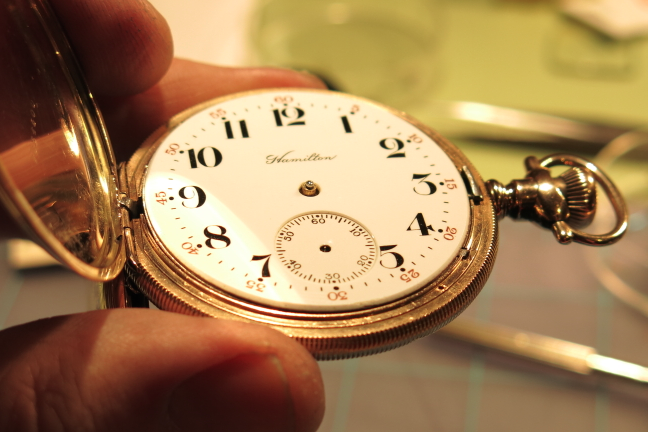 The case is 10K gold filled and the silver dial features solid gold numerals and markers. 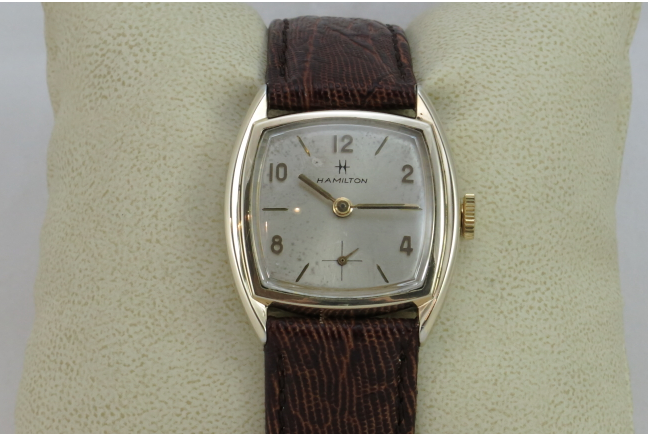 To me the Lindsay is an nice example of the classic 1960's "TV-shaped" watches. The barrel shaped case has a square-ish shaped bezel. There are a number of additional models that would be produced in the 1960's square TV-shaped bezel openings. 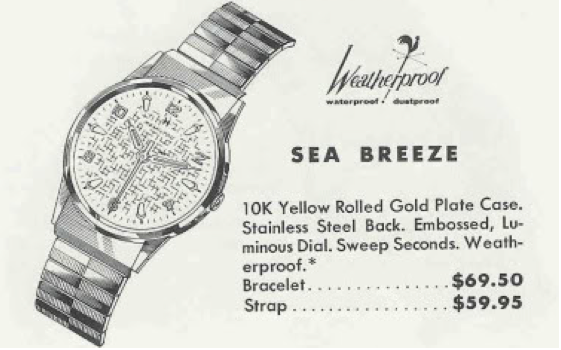 Made for only one year, the Hamilton Sea Breeze was introduced in 1960. The Sea Breeze came in a 10K RGP case with a stainless steel back. The dial is a linen-textured dial with embossed numerals and markers. 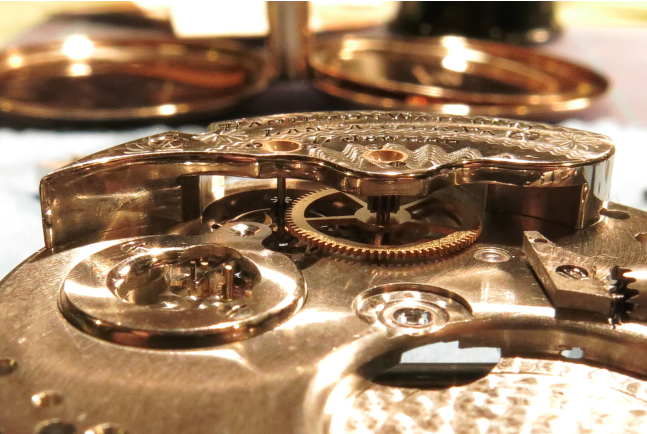 Behind the dial is a 17 jewel Swiss-made 671 movement. I recently overhauled a Sea Breeze for a friend so I can show you how it went. As received it was in really nice shape but not running. 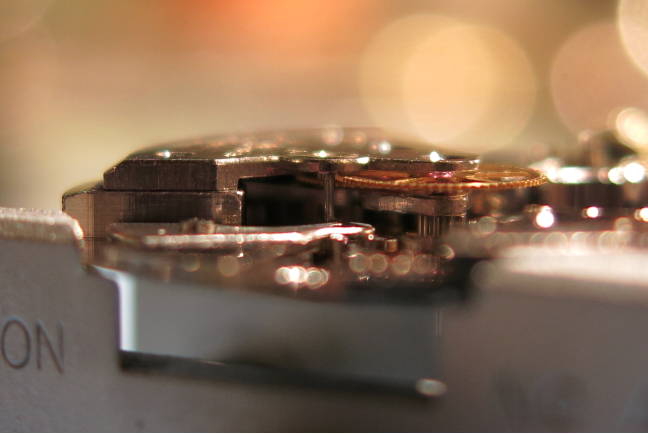 The 671 movement is accessed from the rear, so once the back cover is popped off the watch is ready to come out. The first step is to remove the stem and crown. The stem is held in place by the set lever. The set lever is held by the set lever screw. The set lever screw is usually the screw closest to the where the stem enters the movement. 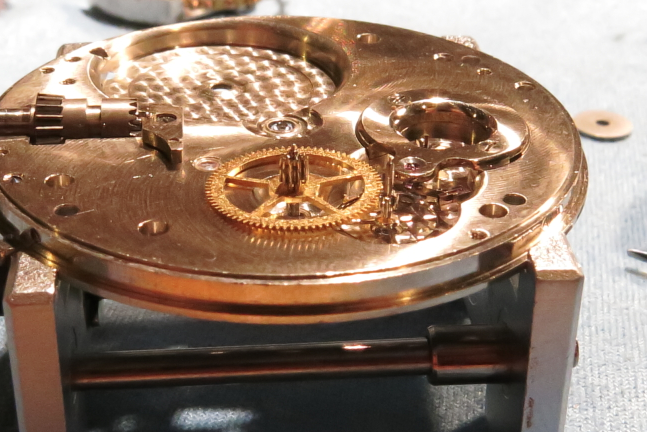 It draws in the set lever towards the stem so that when you pull the crown out you can move the watch into the "set" position. If you loosen the set lever screw a couple of turns the lever moves away from the stem - and then when you pull the stem it will come out. 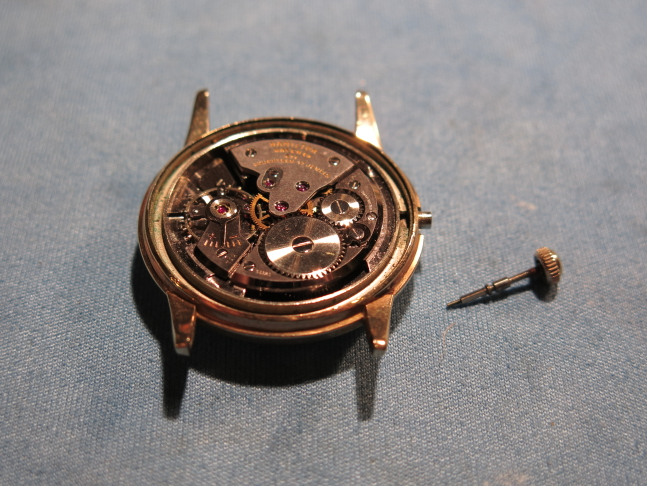 If you find your stem comes out of your watch when you try to set the time, it's likely the set lever screw has come loose. 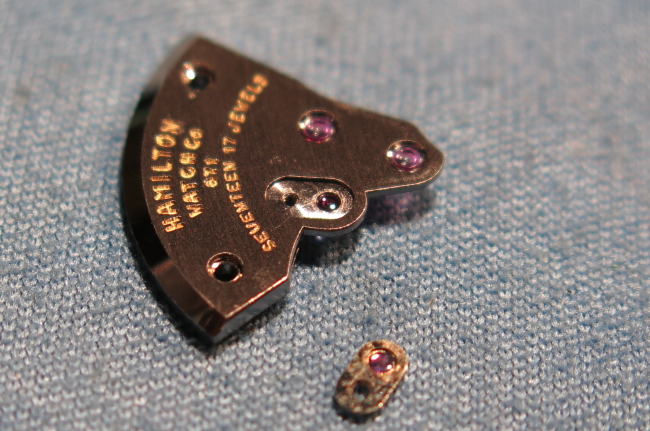 Here's the stem and crown, now removed from the watch. When I flip over the watch the movement will drop right out. 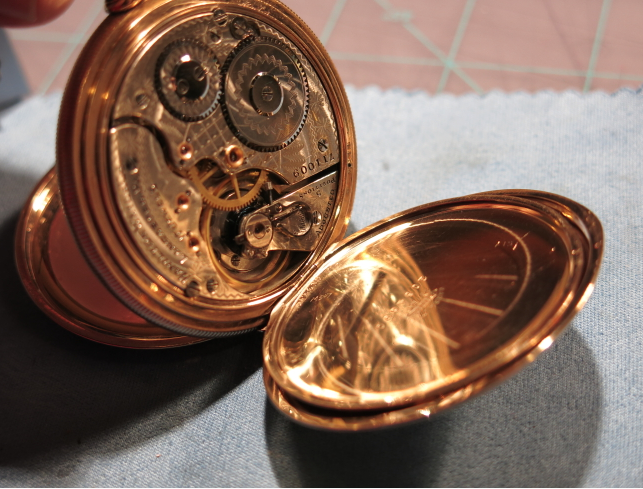 This watch has a movement ring that goes around the movement and helps to hold it securely in the case. It just pops off. 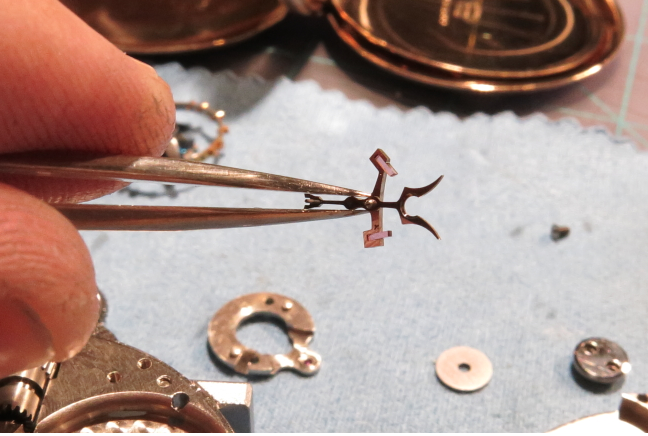 With the movement safely secured in a movement holder, the next step is to remove the hands. Interestingly, once I pulled the second hand the watch started working. Apparently it was binding and stopped the watch. 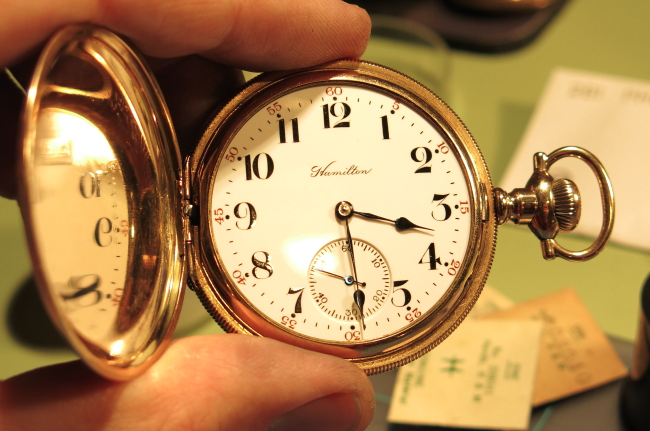 With the hands off, the dial is the next thing to go. 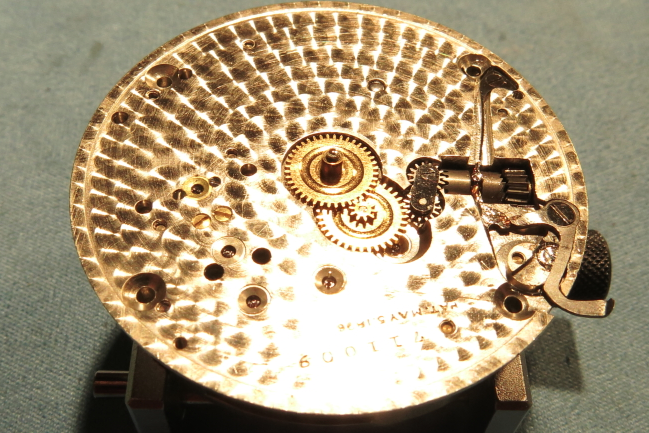 Two dial foot screws located on the side of the movement hold the dial on. Loosen them and the dial comes right off. 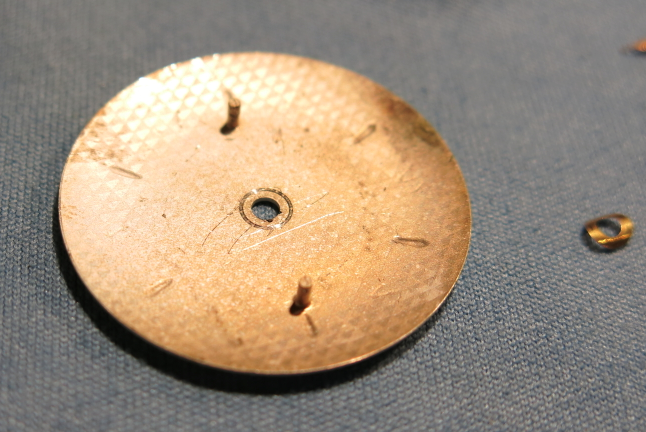 Here's the back of the dial showing the dial feet and the dial washer to the right. The dial washer goes between the hour wheel and the dial. 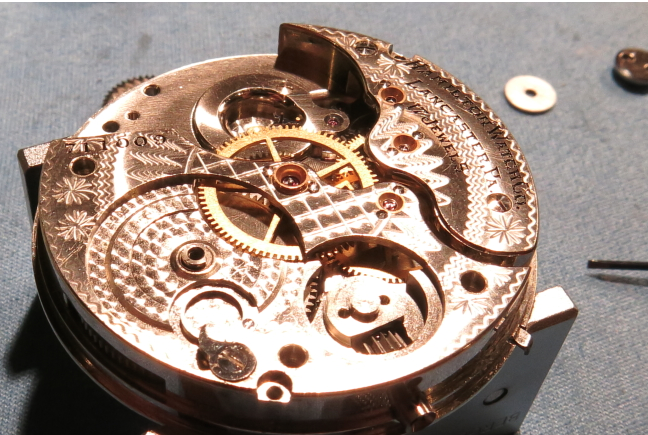 While the movement is dial-side up, the hour wheel, cannon pinion and the other setting parts can be removed. That's all for now... on to the backside. 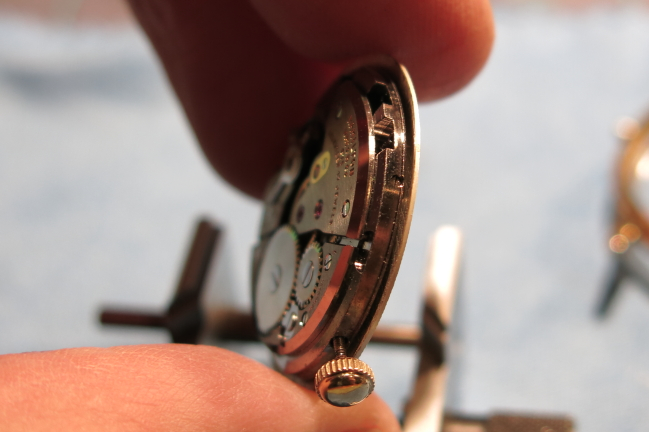 Before any parts are removed from the back, the mainspring tension needs to be let off. That's super-important. 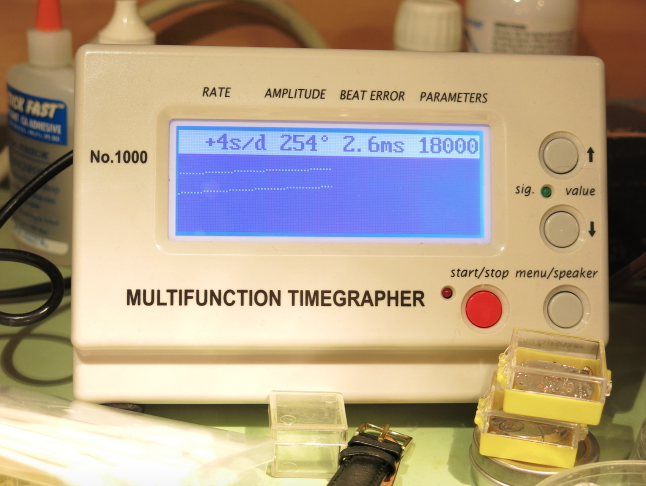 Since the watch was running, it will stop when the tension is relieved. 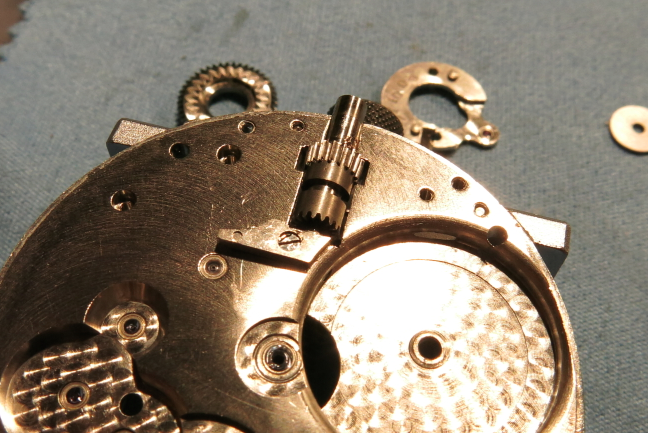 Then the barrel bridge can be removed to give access to the mainspring barrel. 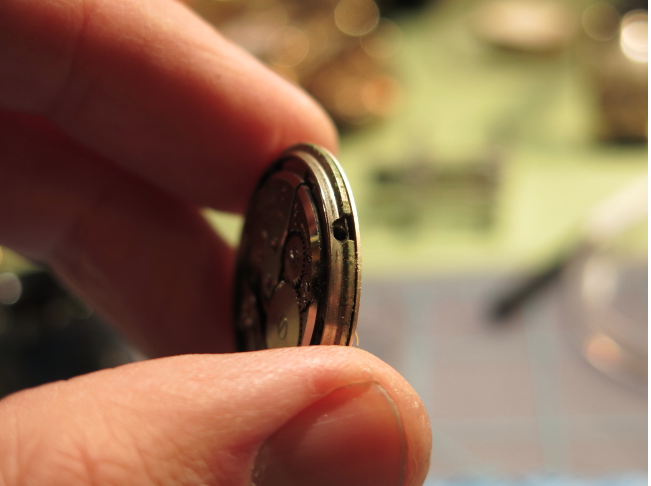 Take the mainspring barrel out and the next part to go is the train bridge. In this watch the train bridge covers the fourth wheel (drives the second hand), third wheel and the escape wheel. With the bridge removed the third and fourth wheels can come out. Under those wheels is another bridge that just supports the center wheel. It has to come out to get final access to the escape wheel. The escape wheel can be removed now but not the center wheel. In this movement the center wheel is blocked by the pallet fork... normally that's the last thing off - but not this time. One screw holds the balance bridge in place - so that comes out next. With the balance and escape wheel gone only the pallet fork and center wheel are left. One screw left to go. Now the backside is cleared of parts. Just a few cap jewels to take off and it all goes into the cleaning solution. 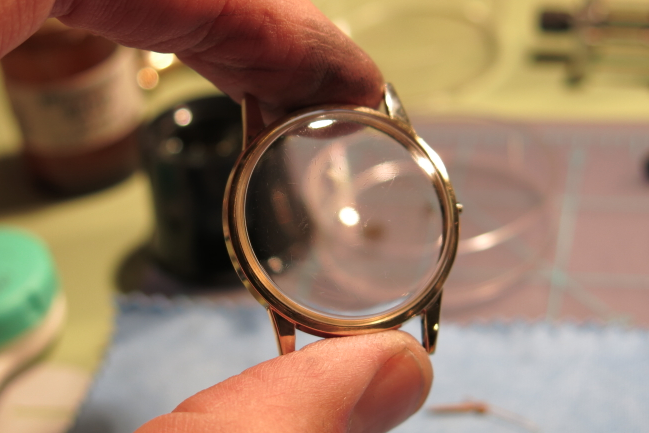 While everything is in the ultrasonic, I'll polish the case and crystal. 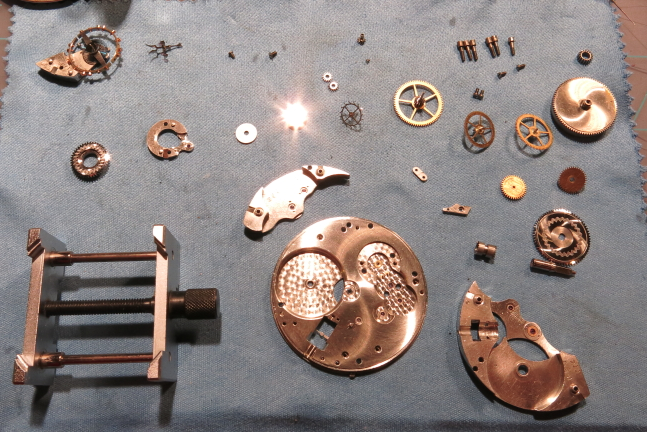 Here's all the parts, cleaned and dried. To put it back together I just go step by step in the reverse order that everything came off. 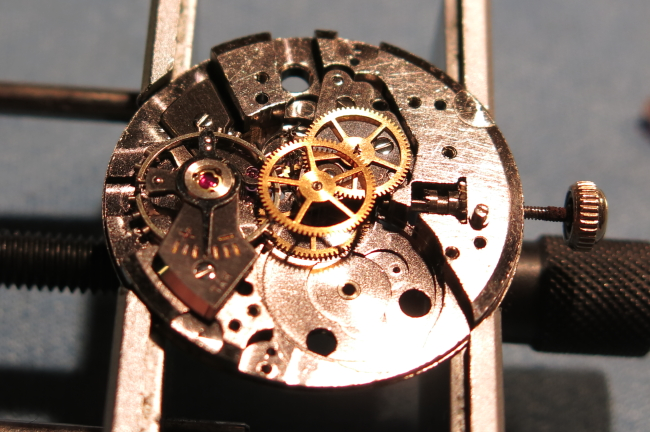 Here's a shot of the cap jewel for the escape wheel. One tiny screw holds it in place. Getting the gear train to all line up under the train bridge can be a challenge. At least with this movement there are only three wheels to line up. Sometimes there are four - and that is really a challenge. In this shot, you can sort of see how the escape wheel and fourth wheel are aligned. The third wheel is observed from a different angle. The bridge will drop into place when everything is lined up. 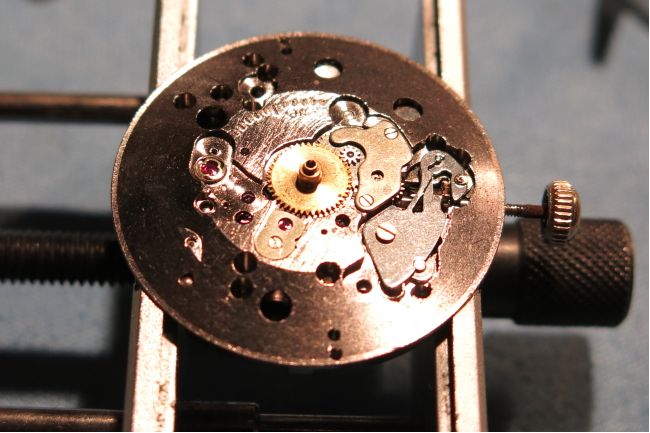 Once all the parts are back on and the mainspring is wound up a little, the balance is reinstalled. In this shot the balance is whirring away in a blur. 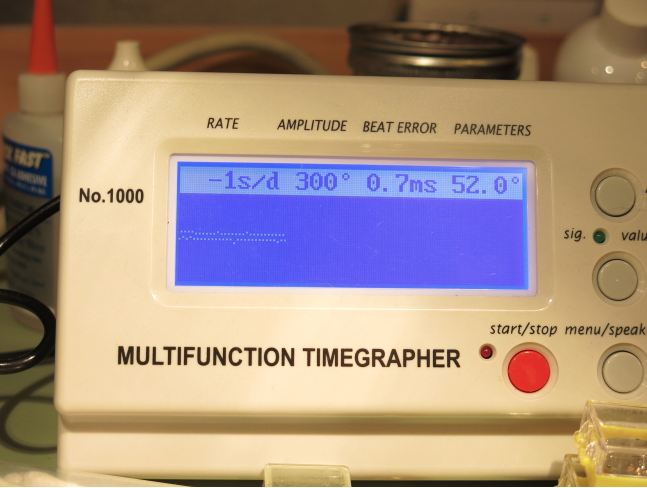 It runs pretty much dead on... 1 second slow per day with good amplitude. It doesn't get much better than that! And here's the finished product, all cleaned up and ready for a new strap. But if I know this watch's owner, there's an original bracelet waiting for it to come home.